Everyone here at Sprint Waste Services knows there’s something special about our company. Industrial and commercial companies across the Gulf Coast rely on us for their waste services. Capabilities and resources of a national waste company, attention and care of a local provider. Rental equipment, hauling and disposal, or a turnkey managed solution across your entire enterprise, we do it all! Sprint Waste Services is a premier, full-service provider of waste collection, storage, removal, hauling, and recycling and landfill services to industrial and large commercial businesses across Houston and the Gulf Coast. With headquarters in Houston, locations across Texas and Louisiana, state-of-the-art technology and equipment, and an impressive transportation fleet, we’re poised and ready to help customers across the entire waste stream—saving you time, effort and money while reducing your company’s environmental impact. Hazardous waste or nonhazardous waste, liquid waste or solid waste, near or far—we can handle all of your waste transporting and waste hauling needs. From roll-off containers to frac tanks and chemical trailers, you can count on our equipment to be delivered in peak condition when and where you need it. What if one hauling company could handle most of your bulk transport needs? With our extensive hazardous and nonhazardous hauling fleet, we can. From rental containers to hauling to LEED certification programs, we specialize in handling construction and demolition waste from project start to finish. Need additional staff at your site? Our trained technicians, project leads, drivers or support personnel can augment your operations with needed manpower and technical expertise. Our portable restrooms and sanitation and septic services give you a short- or long-term solution to your site’s sanitation needs. Our landfill operation in Fort Bend County and our recycling center in Port Arthur provide additional, value-added waste management services. Our organic residuals management services are just what you need to help with removal, processing and disposing of sludge and wastewater. 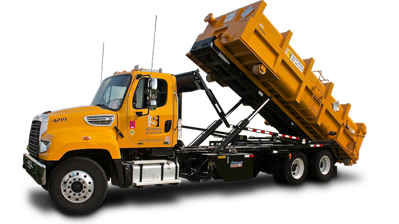 Hauling and disposing of commercial and industrial solid waste is the cornerstone of our business. Find out why so many industrial facilities along the Gulf Coast trust us to provide front-load trash services. Our reliable equipment, outstanding safety record and unbeatable customer service are reasons why top petrochemical producers and refiners depend on us for their emissions control and monitoring needs. Fort Bend Empty Bowls is fast approaching, and the Sprint Fort Bend County Landfill is proud to sponsor this fun event benefiting the East Fort Bend Human Needs Ministry. Congratulations to Sprint Waste Services Safety Manager Robert Blanco, the 2018 recipient of the Joe M.